And perhance we remember, we still know all of these. And insist we all should. We know how to sit still. But we trust it is there. That when problems are arise we should look to the sky. Things assume their right place, and become smaller things. Hey! Hey! come and play! Run with the pack, run around, run away! And perchance we remember, we should listen to these. Narrator: This is Iconium. It could be any place, at any time in history. Any time. Anywhere. Choir : All I want is what I need. My life, a short life. My life, to do what I please. Narrator: The town is built along a river. There’s a market and a school, places to live, places to work, farms and surrounding fields. Like all towns, thee are priests and doctors, hopes and fears, birth and death. But out in the fields, by the river and in the valley, other songs are sung by people wanting to be heard. Wanting all to know that they too once lived, that they too once walked this earth. 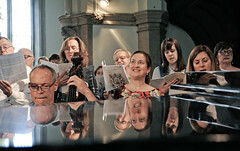 Choir: I am tired and weary but I must toil on till the Lord comes to call me away. Where the morning is bright and the Lamb is the light and the night is fair as the day. There’ll be peace in the valley for me some day, there’ll be peace in the valley for me. I pray no more sorrow and sadness or trouble will be; there’ll be peace in the valley for me. There the flow’rs will be blooming, the grass will be green and the skies will be clear and serene. The sun ever shines, giving one endless beam and the clouds there will ever be seen. Narrator: They sing after the night when no one sees them, in the light of dawn. They sing so quietly they can hardly be heard. But still they sing. Only in the night and in the silences, while the selfish sleep, while the city heads towards destruction, little knowing what it is doing, caring nothing of the future, knowing nothing of the past. Narrator: This is Paul. A stranger in the middle of it all. Paul: Blessed are the pure in heart, for they shall see God. Choir: What is he saying? What is he thinking? Thecla: Listen.Paul: Blessed are the temperate, for God will reveal himself to them. Blessed are they that abandon the world, for they shall be accepted of God. Paul: Blessed are they who have wives as though they had them not, for they shall be made angels of God. Blessed are the pure in heart, for they shall find peace. 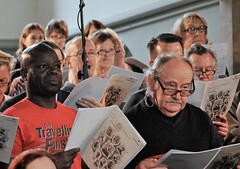 Choir: What is he thinking? What is he saying? What is he doing? Narrator: Through an open window, Thecla hears Paul’s preaching. Thecla: I shall not eat. I shall not sleep. Paul: Blessed are they who dwell in eternal light. Choir: What is she saying? What is she thinking? What is she doing? Narrator: The young girl listening is called Thecla. Thecla is engaged to Thamyris. He notices her changing, her distance. He speaks to her mother. Thamyris: Where is my Thecla? Theoclia: For three days she has not left her window. She does not eat; she does not drink. She only listens to the foreigner. Go and talk to her. Thamyris: Help me speak to her. I don’t know what to say. Theoclia: Child, why do you sit so melancholy? Why do you not reply? Thamyris: Why are you staring out of the window? Why don’t you answer me? Speak to me. Thamyris: What do you mean? Thecla: This world, I do not understand it. I cannot be as others are. Thamyris: But what are you saying? Thecla: I am thinking. I am listening. I want to wait before my future is decided, before I become what others think I must be. Before I become like everybody else. Thecla: It is like a light. Thecla: I have only seen it far away, darkly, in the distance, It is one light but it shines more brightly than any I have ever seen, than any I have ever dreamed. Thamyris: It’s only a light. Thecla: It is hope, And though it may be far away, it is all that I see and all that I know. In me I can see only darkness. But there is the light. dignare clemens supplicum laudes preces que sumere. Qui carne quondam contegi dignatus es pro perditis. mercifully deign to accept the praises and prayers of your suppliants. grant us to be made members of your blessed body. Children: Star light, star bright. Wish I may, wish I might. Star light, grant the wish I wish tonight. Paul: Though I speak with the tongues of men and of angels and have not love, I am become as sounding brass or a tinkling cymbal. And though I have the gift of prophecy and understand all mysteries and all knowledge, and though I have all faith so that I could remove mountains and have not love, I am nothing. Paul and Choir: And though I bestow all my goods to feed the poor, and though I give my body to be burned and have not love, it profiteth me nothing. Love suffereth long and is kind. Love envieth not. Love vaunteth not itself, is not puffed up, seeketh not her own. Is not easily provoked. Thinketh no evil. Rejoiceth not in inequity, but rejoiceth in the truth. Beareth all things. Believeth all things. Hopeth all things. Endureth all things. Love never fails. Thecla: What must I do to be saved? Thecla: And what if I do not know who I am any more? Paul: You will not be as you have been. But you will have no fear. Thecla: I am always afraid. Paul: You cannot marry if you are afraid. You cannot marry if you do not trust. Marriage must be a refuge, a place of safety, not of fear. Perfect love casts out all fear. Thamyris: I’m losing my love to this preaching. I’m losing my love to God. There’s nothing I can do, and there’s nothing I can say, nothing I can do, nothing at all. The city is changing. Because of your words she will not marry me. Because of your words I can no longer love. Paul: I have done nothing wrong. I have preached only the word of God. Thamyris and Choir: You have spoken against us. You have changed the women we love. Now they speak to us of other worlds. They no longer speak of us. The city is changing. Because of your words you must come before the Governor. There you must speak. There’s nothing I can do and there’s nothing I can say. Nothing I can do. Nothing at all. 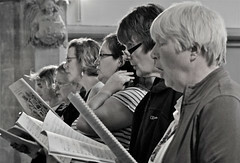 Choir: The city is changing. Because of your words you must come before the Governor. There you must speak. Banish him! Castellius: Let me speak with the stranger. Castellius: Let me discover what he wants. Castellius: What do you teach? Paul: All I have spoken has been of faith: the fear of God, the knowledge of religion, the love of truth. Castellius: You speak of worlds other than our own. Paul: I speak of resurrection. I speak of eternity. Castellius: While neglecting the world we live in.Paul: This world is only preparation for the next. We must renounce its snares and torments. We must go forward with a clear heart, free of corruption and shame. Castellius: Some of us like its snares and its torments. Castellius: Take him to the prison! Choir: You have spoken against us. You have changed the women we love. Now they speak to us of other worlds. They no longer speak of us. Paul: I have only spoken of my faith. Castellius: Perhaps you have spoken too much. Theoclia: They have taken him to prison. Thecla: He has done nothing wrong. Theoclia: He has set women against men, wives against husbands. Children. If he stays, the city will be destroyed. Thecla: He wants us to be free. He wants us to be cleansed. Children. If he stays the city will be destroyed. Children: Star light, star bright. Wish I may, wish I might. 7 Death, Where is Thy Sting? Paul: I am not afraid. Paul: What are you afraid of? Thecla: Of life, of death. Paul: Then stay with me. Thecla: Talk to me. Tell me of your faith. Paul: It is all that I have. All that I know. Freedom from life, freedom from death. Thecla: What happens when we die? Paul: We shall all be changed. Thecla: I want to know if death is more than sleep. Paul: We shall not all sleep, but we shall be changed. In a moment, in the twinkling of an eye, at the last trump. For the last trump shall sound and the dead shall be raised incorruptible. And we shall be changed. Choir: O death, where is thy sting? O grave where is thy victory? Theoclia: She has gone to see Paul. Thamyris: But he is in prison. Theoclia: She will not leave him. Thamyris: Then we must make her leave him. Narrator: Thamyris goes before the Governor. Thecla is brought from the prison. Castellius: Why do you not marry this man according to our law? Speak to me. Theoclia: She will not speak to us. Thamyris: If she will not answer, if she will not marry, let her be burned. She has brought disgrace and shame to my name and to my family. Without my honour I am nothing. Without my name I am nothing. Thecla: There is but one way I can be saved. Thecla: By renouncing this world. Castellius: You will not marry? Castellius: Then you leave me no choice. What future is there for a city if the women refuse the men? Thecla: I have no fear of death. Castellius: Then you are lost. Thecla: No. I am found. Castellius: Paul, you must leave the town and never come again. Paul: I will not cease my preaching. Castellius: You are lucky still to live. Go. Go now! And Thecla, you will not renounce this faith? Castellius: Then you must die. Thecla: Only to live again. Anew. Children: Thecla must be burned. Burned at the stake. Thecla must be burned, punished for her sins. Choir: Burn her! Flay her! Bind her! Punish her! Choir: Come death. Come as the match to light the wood. Come as the wind to kindle it. Come as the fire to burn me. Come as the flames to give me light. Come death. Come as the waters cover the land. Come as the flowers appear in the field. Come as the calm after the storm. Come as peace after fury, like the returning tide. Come as the blessing on a stranger. Come as the light after darkness. Narrator: The fire is lit. Thecla begins to burn. But then, as the flames rise: a storm, thunder, lightning. A flood washing the flames, washing the city. Paul: O Lord Jesus Christ, grant that the fire may not touch Thecla, but be her helper, for she is your servant. Narrator: The people flee. The fire fades. Thecla lives. Children: Come with us, out of the city. Come with us, into the light. Narrator: The children come to free her. The children lead her to safety. The children take her to a cave. To Paul. Paul: You have lived. You have come from the flames, beauty for ashes. Children: Come with us, out to a new life. Come with us, into the light. Come with us, on a new journey Come with us into the light. Narrator: Thecla travels with Paul. She begins to live the life of faith. Narrator: Thecla and Paul travel through towns and villages. People follow them from place to place. It’s a simple life, a kind of pilgrimage. Children: How many miles to Babylon? Four score and ten. Will we get there by candlelight? Yes and back again. So many roads, so many miles, away from all we know. Walking, keep walking. Singing, keep singing. Till we get where we must go. Narrator: They come to Antioch. It could be any place, at any time in history. Any time. Anywhere. Choir: Any time or anywhere. Any place, we don’t care. What’s it got to do with you? Narrator: Here is another man determined to marry Thecla. He’s called Alexander. He usually gets what he wants. Alexander: You. I want you. Thecla: I am not free. Alexander: That is no excuse. Thecla: Force me not, who am a stranger. Force me not, who am a servant of God. Alexander: You will obey me. Narrator: Thecla defends herself. Alexander is ashamed, humiliated. He determines on revenge. Alexander: She has brought disgrace and shame to her name and to her family. Narrator: Thecla is blamed for humiliating Alexander. It’s all her fault. She’s on trial again. She’s sentenced to death. Again. Choir: Let her burn! Let her be drowned! Let her be thrown to the wild animals! Alexander, Choir, and Children: Let her be burned! Let her be drowned! Let her be thrown to the wild animals! She has brought disgrace and shame to my name and to my family. Without her honour, she is nothing. Without her name, she is no one. Narrator: Thecla prepares for death. She goes down to the river. Down to the river to pray. Choir: Wade in the water. Children and Choir: Who are these Children dressed in red? Thecla: O Lord, help me to understand that this life is but a preparation for the next. Give me the grace to abandon the cares of the world. Children and Choir: Who’s that young girl dressed in white? Thecla: For though the days of our life are long, the years are short, and nothing that is mortal can endure. The earth will wither and die. The waters will run dry. Our flesh is as the grass. Fill me with the courage to leave all that fades. Endow me with love. Succour me with trust. Thecla: Bless me with faith and lead me to the life everlasting. Children and Choir: If you get there before I do, tell all my friends I’m coming too. Narrator: Thecla is led out into the Arena, thrown to the lions and other wild beasts. Choir: Strip her! Bind her! Tear her apart! Drink her blood! Gorge on her flesh! We don’t want her near us. We don’t want her with us. Children Alexander and Choir: We don’t want her preaching. We don’t want her speaking. There is nothing that she says, that she does, will make us change. Thecla: My heart is ready for I have been blessed. My head is ready for I have known. My body is ready for I no longer need it. Choir: This is our life as we live it. This is our life as we know it. We know what we know and we don’t want to change. It’s all we can do just to live. Narrator: More beasts are released into the arena: wild bulls, dogs, and wolves. Alexander and Children: Let the beasts devour her! Let the animals kill her! Don’t ever tell us! Don’t ever tell us to change our lives as you want! We cannot do that. We must do as we do, live as we live, do as we do, live as we must live! Thecla: Give me the grace to make death no stranger. Give me the wisdom to accept what comes. Give me the grace to know how to live and how to die. Narrator: But the Children of the city, and the women of the city, seeing Thecla’s goodness, seeing Thecla’s grace, throw rose petals. Perfume the air with cassia, spikenard, jasmine, and lily of the valley. Thecla: Give me the grace to welcome another life and go there, ready and unafraid, to find an endless rest. Give me the grace to make death a friend. Narrator: The Children keep throwing the petals. The air is filled. The beasts are enchanted, stupefied. Thecla remains untouched. Paul: Yea, though I walk in the valley of the shadow of death, I will fear no evil: for thou art with me; thy rod and thy staff, they comfort me. 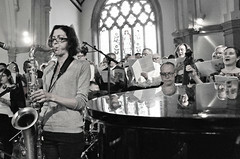 Choir: O Death where is thy sting? O Grave where is thy victory? Yet I say to you that even Solomon in all his glory was not arrayed like one of these. I know that my Redeemer liveth, and that He shall stand on the latter day upon the earth. Alexander: Who are you that not one of the beasts will touch you? Thecla: I do not know. I gave up my former life and live as anew. Alexander: You believe that your faith has saved you? Thecla: I am not certain; I can only trust. But whether there be prophecies, they shall fail; whether there be tongues, they shall cease; whether there be knowledge, it shall vanish away. For now we see though a glass darkly; but then, face to face. and now abideth faith, hope, love. But the greatest of these is love. Paul and Choir: Love suffereth long and is kind. Love envieth not. Love vaunteth not itself, is not puffed up, seeketh not her own. Love rejoiceth in the truth. Bareth all things. Believeth all things. Hopeth all things. Endureth all things. Love never fails. ALL: Now abideth faith, hope and love. Thecla and Children: Star light, star bright. Wish I may, wish I might. Star light, grant the wish I wish tonight.